A significant number of wearers leave comments that the Under Armour Curry 6 is the best Stephen Curry basketball shoes they ever had. Most users claim that these Curry basketball sneakers break in nice and quick. A good number of buyers appreciate the durability and flexibility of the shoe’s knit upper. Even with dust, the translucent rubber outsole of the Curry 6 grips court floors well. A team of testers appreciate the full-length HOVR cushioning for many reasons. They say it has good court feel, is quite responsive, and provides impact protection. Many wearers notice that the Under Armour Curry 6 is well ventilated. They say their foot stays dry all the time. According to most, the insole is an upgrade from the previous Curry models’. It is so soft that it feels like memory foam. Several agree that the Heart of the Town colorway of the Curry 6 is fiery hot. The speed plate delivers a smooth heel-to-toe transition, say some reviewers. Most Curry 6 owners recommend these shoes to new buyers. They say it is such a huge improvement to the Curry 4 and 5. 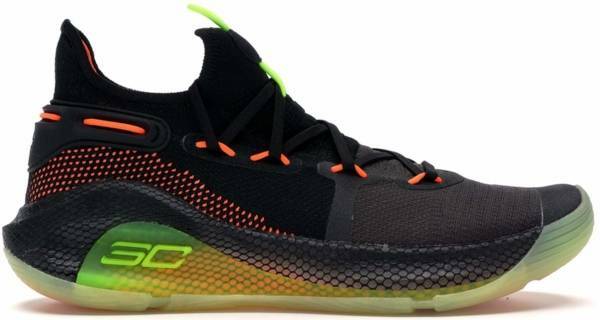 A lot of testers do not recommend the Under Armour Curry 6 for outdoor hooping. They notice that the outsole rubber frays easily. A handful of wearers complain that the Christmas in the Town colorway of the Curry 6 gets dirty easily. The rubber outsoles of these Curry 6 shoes become the subject of complaints from Instagram users. They say that when pressure is applied on the forefoot angles of the flex grooves, the rubber pops and tears. The tongue is thinly padded. According to some users, the shoe laces dig into their foot when they are tightened. The Under Armour Curry 6 is a strong contender for the number 1 spot on the list of the best basketball shoes of 2019. It may not have the best cushioning like Nike’s Zoom or Adidas’s Boost, but it certainly delivers on what’ important. Wearers get to experience court feel, responsiveness, and impact absorption in one full-length HOVR cushioning. The traction is perfect for any court condition even if the outsole becomes covered with dust. I liked playing in the Curry 1. I loved playing in the Curry 2. Curry 3 was meh. Curry 4 was amazing. Curry 5 was… painful. The Curry 6 is easily the best they’ve done and it has been a blast to play in. It’s always a good sign when I don’t want to stop wearing a shoe once testing is complete because I like playing in them so much — that’s what it’s like for me and the Curry 6. I love everything about them — although I’d have done something slightly different with the traction. Is it the best Curry to date? Yes. It’s the most well-rounded of the bunch that will cater to more than just the player that wants court feel. It has something for everyone, which is what a good performance shoe will offer. While it may be made for the player they’re named after, you’re trying to sell the shoe to everyone but him (her). You can only do that successfully if you make a shoe “everyone” will want to play in rather than just focusing on one athlete. Solid job by Under Armour. I can’t wait to grab a few more colorways once they’re available. I love playing in these. I really enjoyed playing in these. The cushion is actually pretty nice. I like how mellow it is and how responsive it is. The traction is really good. Fit, support, and the overall upper being so minimal and soft on my foot. The only problem for me is the durability. For $130, it's definitely a great performance shoe. It's really fun and it's definitely a top performer. So what I'm thinking is if this rubber durability thing is only on this particular colorway, then this is definitely a cop because this is a great performer. It has everything that I want and nothing that I don't. Overall, the cushion is amazing. The fit is amazing. And the traction is really nice. Not Curry 2 level, but I think it's maybe the second best or third best out of the Curry line. And is still a very high level because the Curry 2's traction was insane. So if the rubber durability thing is only with this colorway, then this is definitely a cop. According to Under Armour Curry 6 designer Leon Gu, Stephen Curry runs approximately 2.3 miles per game. The shoe is designed more as a running shoe to meet his needs. The full-length HOVR is implemented to give Curry impact absorption and energy return. The full-length knit upper is a first in the Curry line, and it gives a secure lockdown. The Speed Plate is tailor-made for Curry. It rises a little on the lateral side to deliver stability. In a game, every two-second period is made up of different surprising movements such as sprints, jumps, skips, acceleration, deceleration, and back-peddling. Therefore, traction is crucial, and the UA Curry 6 don’t hold back with it. The outsole is split for the shoe to decouple better. Cushion. The Under Armour Curry 6 features a full-length HOVR cushion. Originally made for running, it is restructured to become bouncier but remain firm enough to keep it under control. The design team of Under Armour makes sure that every player gets every bit of benefit from the HOVR cushioning. It promises court feel, impact protection, explosiveness, and responsiveness. To sustain the shape of the HOVR cushioning, it is entirely covered with Energy Web, which can be seen on the sides and the outsole. The full-length Speed Plate works like a midfoot shank. It extends to the lateral side of the Curry 6 shoes to provide adequate torsional support. It is also segmented on that side. During cuts and crosses, the SpeedPlate bends and springs back immediately to ensure stability. It also allows wearers a quick footwork switch in a split second. Traction. The shoe is designed like a running, making it lighter, smaller, and faster. It is built for a guard’s need for speed. The outsole of the Curry 6 is divided into three sections in response to Stephen Curry’s footwork. The heel area has an axe-like groove. The forefoot has six sections that are designed to give better support to Steph’s explosive basketball movements. The midfoot are is the least altered, featuring only thin parallel grooves. Speaking of lines, the lateral side features a series of parallel lines that follow the outline of that side of the shoe. The medial side has a cross-hatched pattern that is inspired by the stucco found in the house that Steph grew up in when he was Charlotte, North Carolina. The unique pattern that is created delivers superior traction on any court surface. Length and Width. The Under Armour Curry 6 comes in the standard length and width. A huge number of wearers claim they chose their true Under Armour size and the fit is amazing. However, there are claims that the Curry line is generally not wide-foot friendly. Therefore, new buyers with wide feet are advised to fit the shoe prior the purchase. Lockdown. The Curry 6 shoes uses the standard lace-up system. The flat shoelaces, when tied properly, achieves a great lockdown and secure fit. The full-length knit textile upper has fuse overlays in the toe box and eyelets for durability. The heel counter is overlaid with rubber that delivers protection. It also comes with enough padding to keep the wearer comfortable. The low-top Under Armour Curry 6 is styled as a running shoe. The lateral side has the Stephen Curry logo. The tongue has the the Under Armour logo and the "30:6" callout. The insole has Steph’s logo, the "IN THE TOWN" callout, and the number 10, which represents the years Curry has stayed in Oakland. The forefoot of the outsole has the names of his wife and two children. The middle of the outsole has his signature and "I CAN DO ALL THINGS." Under Armour, Stephen Curry, Dee-Nyce, and the Fly Boys Couture Club (FBCC) class collaborated to design the Christmas in the Town colorway for the Curry 6. The white and blue upper interprets the white snowcaps of the mountains that surrounding the icy blue Lake Tahoe. The snowflakes on the insole and outsole of the Curry 6 are specially drawn by children of FBCC. The colorway was released on December 22, 2018. Stephen Curry’s love for Oakland City shows in the Fox Theater colorway. The theater reopened in 2009, the same year he signed with the Golden State Warriors. Released in his tenth year in the city, the Curry 6 has neon orange and green details that reference the lights of the theater. This colorway was released on January 4, 2019. Scheduled to officially release stateside on January 18, 2019, the fierce all red colorway represents Stephen Curry’s love for Oakland CIty. There are only two pairs made by Mache for the Moon Landing colorway. The pair worn by Stephen Curry on January 3, 2019 against the Houston Rockets were auctioned off on eBay. The bid was from January 7 to 13 as an exclusive collector’s item. After 113 bids, it was sold for $58,100 on January 14. Through the collaboration of the Stephen and Ayesha Curry Family Foundation and DonorsChoose.org, the proceeds will go to the STEM education in the Bay Area.